A fresh Italian salad with Escarole who could resist a healthy salad in summer heat, it's the perfect alternative to regular lettuce, well at least for me. Sometimes just a light meal can be perfect in the warmer months or hotter climates. I make this Italian salad often. You can add anything you like additional. I sometimes put chickpeas and some sauteed mushrooms with white wine and garlic. You really can make a whole meal out of this light salad. See some of the other suggestions below to add. 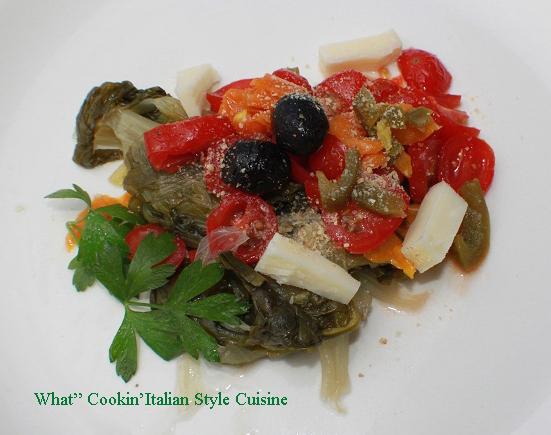 Tailor it your your liking, I like to call this my escarole antipasto Claudia style! 1/4 cup of each balsamic vinegar and olive oil, mixed with 1/2 teaspoon each(use fresh when available)parlsey, oregano, basil, red pepper flakes, salt, pepper to taste and 1 tablespoon grating cheese. Blend all together and toss with the vegetables. In a bowl mix the peppers, tomatoes, parsley, provolone and artichoke hearts at this point add any meats you would like then toss with the salad dressing. Optional: proscuitto chopped, genoa salami chopped, pepperoni cut up, hard boiled egg slices, mozzarella diced, chunk Tuna in olive oil, chickpeas or white beans, mushrooms or zucchini sauteed. Place a bed of sauteed Escarole on plate. 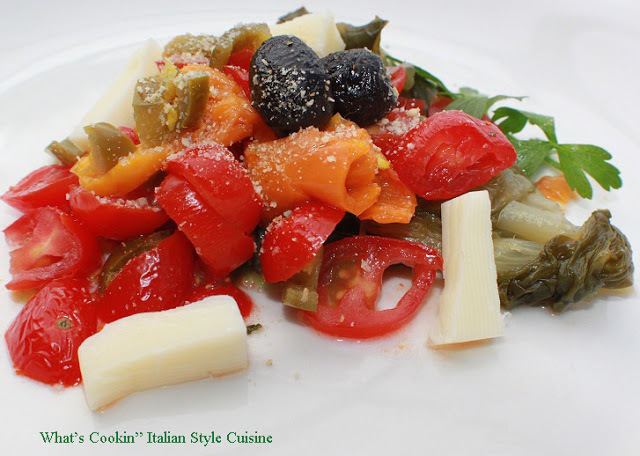 Top with mixture of vegetables on top, olives and and serve with grating cheese and crusty Ciabatta Italian Bread.